The 30.7 metre motor yacht Powdermonkey, listed for sale by Charles Crane at Engel & Volkers Yachting, has been sold in an in-house deal. Designed by Stefano Righini, Powdermonkey was built in GRP by Italian yard Falcon Yachts to RINA class and MCA coding with delivery in 2004 and a full refit in 2014. An interior in rich cherry wood panelling and light coloured carpeting accommodates up to 12 guests in five cabins consisting of a full-beam master suite, VIP suite, a double and two twins with Pullman berths. All guest cabins have entertainment centres, flatscreen televisions and en-suite bathroom facilities, while there are also quarters for five crewmembers. The main-deck saloon is surrounded by wraparound windows, creating a light and airy area with comfortable seating, a bar and an entertainment centre including a large flatscreen television, while forward is a formal dining room with seating for up to ten guests. Lovers of the outdoors are well catered for by a sheltered aft deck with seating and a table, while the flybridge offers further al fresco entertainment with a bar, barbecue, settees, table, sunpads and sun loungers, all sheltered by a Bimini top. A popular charter yacht, Powdermonkey comes complete with a range of water toys, including a Zodiac tender, two SeaBob water scooters, snorkelling gear and a selection of towables including water skis. 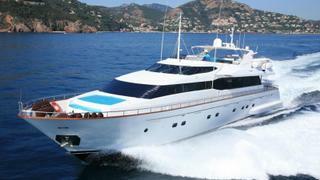 Twin MTU 16V 2000 M90 diesel engines give her a cruising speed of 20 knots and a top speed of 24 knots.